Early Days is a memoir, focusing on two particular time frames from Miss Read's younger days. The first section happens around the time when she was four and focuses on her relationship with her grandmothers. The second covers the time when she was in elementary school. There's a great simplicity in Miss Read's writing style, a calm delight in life that I find so relaxing. I mentioned back in 2008 that Miss Read is likened to Jan Karon and I think that's true. Where Karon has small town America cornered, Miss Read writes of the places she knew and loved in the English countryside. Especially now that we've visited that area, it's an extra special delight to spend time with Miss Read. As mentioned, this book is autobiographical in nature. 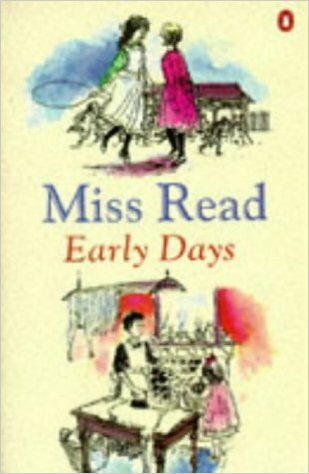 Miss Read explains in the introduction that she wanted to write only about her childhood for a few particular reasons. The first reason is that she felt that moments in her childhood stood out to her more clearly than moments in her adulthood. Secondly, she recognized that to write about her adult life would only offer her perspective on certain events which transpired. This is not to say that she did not write down stories of her adult life at akkm because she suggests that she did exactly that, but not for publication. She acknowledged that her descendants might find her recollections amusing and informative but since they were her recollections, they didn't necessarily need to see a publisher. I found this to be a wise admission - to say that you are only you, with your own way of looking at the world. She understood that she had her own perspective on life, but that others might be inclined to see them differently. Not wishing to disrespect those in her life, or create unnecessary arguments, she stuck to discussing her childhood and even then submitted her manuscript first to her sister and others who could fact check and correct any misconceptions she had about her early years before publication. I so appreciated this. It's rare that you come across people who self-examine with enough regularity so as to understand that they only have their opinion. Miss Read displays a rare caution and that only made me love her more. Early Days is a charming book of recollections. Miss Read begins by explaining her relationship to and with both of her grandmothers. She tells us of their appearance and personalities and how she felt when visiting their homes. She clearly had a great love for both of her grandmothers that is quite touching. The second half focuses on the time period in which her family moved to the countryside. Once in the country, Miss Read realized that she was, in fact, an introvert and really took to the calm, quiet of the area. She loved her country school house, the slow and steady pace of life, and the opportunity she had to revel in nature. She loved the country for the rest of her life. She knew she belonged in it. I can definitely identify with these sentiments! If you are interested in learning more about Miss Read or her stories, this book is a great place to start. Village School was her first work of fiction and is also a fun starting place. If you like Jan Karon, you will like Read. Both have a smart sense of humor and love of peace which I am greatly attracted to. From the looks of things, it's fairly easy to snag books by Miss Read on Amazon. Next time you find yourself in a used bookstore, you might poke around and see if you can find some of her titles. Pure delight! As an additional note, here's a historical fun fact about Barter Books which also includes some video snapshots of the store for you to see. P.S. I also found some D.E. Stevenson. I've run across a few Miss Read books from time to time. Delightful! Calm and gentle, peaceful, unhurried. I really enjoyed them. I read a few of the Miss Read novels when I ran out of Jan Karon and Phillip Gulley books a few years ago. I still have a couple on the TBR shelf. Charming books. And they fit the bill when I need a quiet read in the midst of all the noise of daily life. Thanks for highlighting her. Also, very jealous of your visit to Barter Books! Sounds like heaven. I have one Miss Read book on hand somewhere, I think - started it once but never finished and kept meaning to go back and try it again. I don't remember finding her quite as engaging as Karon (I think someone saying she was was what propelled me to try her in the first place), but I can't say why since I can't remember much of what I did read. I definitely want to try her again, because everyone I see who mentions her says she is good. Absolutely delightful. Wonderful recollections of the country childhood which gave Miss Read's later depictions of village life such universal appeal. I love Jan Karon, so I'm putting these on my reading list! I NEED peaceful reads these days, so this looks perfect.